My article, Exploring Native Design: Design in Academic Settings, in the Spring 2014 issue 2 of First American Art Magazine. ON HUNDREDS OF COLLEGE CAMPUSES every term, a flurry of activity within Native student clubs and associations, cultural centers, and academic programs, presents an opportunity for Native-made design. For every student group, a chance for a logo exists. For every powwow, guest speaker, community gathering, or other event, a flier or poster needs to be made. And indeed, a wealth of Native-made design on campuses can be found, created by amateurs and budding professionals alike. Designs involving Native imagery serve an important role in campus settings where, aside from entities such as tribal colleges, Native students and faculty are often a small minority. By and large, such schools can be culturally alienating – references to Indigenous cultures and people are few and far between. In a social climate where Native people have been long misrepresented, where nuances in Indigenous visual meanings are not part of the mainstream cultural vocabulary, Natives designing for and representing Natives is a needed form of self-agency and empowerment. Even in more inclusive settings, good design by Natives for Natives provides a sense of familiarity, community, and understanding; serves as a visual refuge; and operates as a source of pride. Design can serve as an important reinforcement of identity – for example, a logo for a Native student association essentially represents those students and carries emotional weight as well. Designing for one’s Native community builds meaningful connections and is a way for individuals to use their skills to give back to the community as well as speak for themselves as Native people. For beginning or student designers looking to put their design chops to the test, campus settings provide a good opportunity to do so. While I don’t generally wave around the often-exploitative phrase “it will build your portfolio,” designing within the campus setting is a good way to get your feet wet and has its benefits, in spite of low to no budgets. The creative freedom to experiment exists with relatively low risk involved. A more personal connection and passion for the subject matter, in tandem with skill, can produce some very good work. Having your work seen in public or having even hundreds of people attend an event thanks to a design you created is rewarding and encouraging. For those wishing to do future work for Native entities, it’s also helpful to have relevant examples to show. Seeing early work such as powwow fliers in the portfolios of budding professional Native designers is not uncommon. Ideally, the experience will also provide future connections in what can be a tight-knit community. For the designer-in-training, organization logos are an opportunity to explore more conceptual approaches to previously created designs, whether by Natives or non-Natives, to improve and refine where needed. 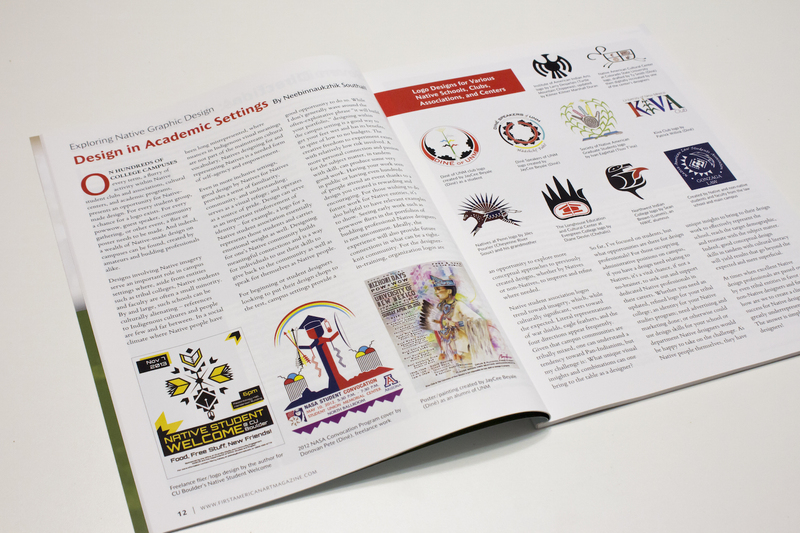 Native student association logos trend toward imagery, which, while culturally significant, veers toward the expected. Literal representations of war shields, eagle feathers, and the four directions appear frequently. Given that campus communities are tribally mixed, one can understand a tendency toward Pan-Indianism, but my challenge is: What unique visual insights and combinations can one bring to the table as a designer? be happy to take on the challenge. As Native people themselves, they have unique insights to bring to their design work to effectively represent the school, reach the target demographic, and resonate with the subject matter. Indeed, good conceptual design skills in tandem with cultural literacy will yield results that go beyond the expected and mere superficial. At times when excellent Native design professionals are passed over by even tribal entities in favor of non-Native designers and firms, how are we to create a climate of success for Native designers, who are greatly underrepresented in the field? The answer is simple – hire Native designers! This entry was posted in Uncategorized on February 1, 2014 by Neebinnaukzhik.